Wild strawberries are an excellent addition to any backyard garden. Also called Frais des bois, or Woodland strawberry, this tiny, intensely fragrant fruit produces from early spring until fall. 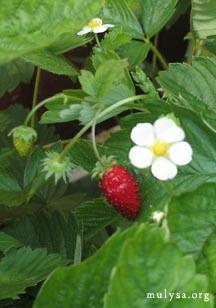 It is an easy to grow perennial that does not send out runners like standard strawberry plants. Its neat, mounded habit makes an excellent edging plant or groundcover. Wild strawberries can also be grown in hanging baskets, strawberry jars or with flowering annuals in containers. Because the plants produce over a long period, just a few berries ripen on each plant per day, so 3 to 4 dozen plants should be grown to supply a family. Luckily, they don't take up much space. Like regular strawberry plants, they have dark green, trifoliate leaves and white, five-petaled flowers with a yellow center. There is also a variety with sweet yellow fruits. Grow wild strawberries in full sun to partial shade. In hot climates plant in a location that receives protection from the afternoon sun. They prefer a moist, fertile, well-drained soil that is slightly acidic. If your soil contains a lot of clay or drains poorly, amend it with organic matter and plant in hills or in raised beds. Strawberries are not tolerant of salty soil, so avoid planting near roadsides in regions where de-icing salts are used. Plants are hardy in zones 3 to 10. There are several cultivars available, choose those suited to your region. Wild plants are easily started from seed, or can be bought as transplants. Plant the crowns right at ground level. Plants are very easily divided in early spring just as the new growth appears. Lift plants and pull apart the crowns. A one-year old plant can be split into three or four new plants. Mulch plants with straw to help soil retain moisture and keep fruits clean. Straw is the tradition mulch, and does work well. It also helps keep weeds down, which is important, as strawberries don't deal well with root competition. Plants benefit from division every two to four years. During warm weather and fruit bearing season, keep strawberries well watered. To feed plants, top-dress the soil with compost at the beginning of the season before mulching. Too much nitrogen will cause excess leaf growth and poor fruit production. During winter in cold climates, mulch plants with straw or loose leaves to keep the ground temperature more even and prevent frost heave. If slugs and snails are a problem in your garden, put out non-toxic slug bait or traps or use copper strips around the plants. Aphid infestations can be sprayed off with a strong blast of water from the hose. Wild strawberries are less prone to disease than other berries. Small animals do like the fruits however, so chicken wire is sometimes recommended. Companion plants such as mint, alliums and marigolds also seem to help. Harvest berries daily during production season. Once ripened, the fruits last for just a day, so check plants often and discard any over-ripe berries. Look for berries that are uniformly bright red and slightly soft, with darkening seeds. Pick off the plant with the stem and cap intact, and collect in shallow containers to prevent bruising. Alpine strawberries are very delicate and should be used within a few hours. Fruit is really best eaten right off the plant, or immediately after picking with cream, sugar or on cereal. They are a gourmet treat in pie, jam, ice cream, shortcake, or dried. However, you'll need quite a few of the tiny berries. If you can resist eating them all, add your daily cache to a container in the freezer until you have enough to cook with. In the landscape, alpine strawberries are a lovely edging along a flower-bed or walk. Plant them in a well-traveled part of the yard so they can be picked often. Whole stems of wild strawberries with the buds and flowers attached have been used in floral arrangement to amazing effect.